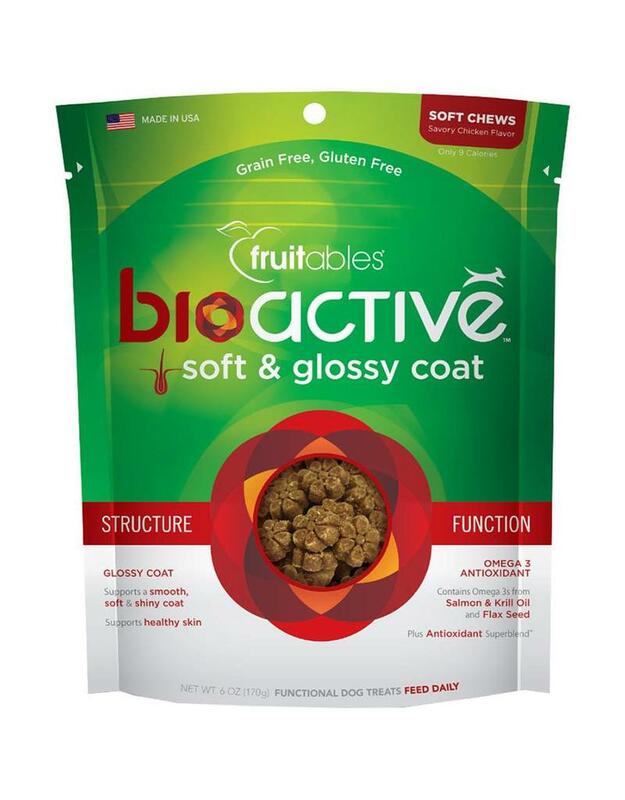 Skip the supplements with Fruitables BioActive Soft & Glossy Coat Soft Chews Dog Treats, an easy solution for improved skin and coat health. This nutritious chew is filled with an omega superblend of salmon oil and flaxseed to support healthy skin and keep fur soft and shiny. Made with savory chicken plus a boost of antioxidants from sweet potatoes, this nutritious snack is the ideal yet tasty way to keep your pet’s coat looking great. Ingredients: Chicken, Chickpea Flour, Sweet Potato, Flaxseed, Honey, Vegetable Glycerin, Tapioca Starch, Salmon Oil, Natural Flavor, Dried Whey, Phosphoric Acid, Mixed Tocopherols (To Preserve Freshness), Sunflower Lecithin.